Water entered the building through its windows in recent bad weather. 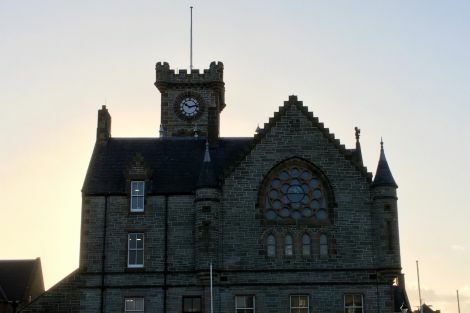 A SURVEY has been carried out and repairs are expected after water began leaking through the windows of the newly refurbished Lerwick Town Hall during recent bad weather. Shetland Islands Council capital programmes manager Robert Sinclair said on Thursday that “during recent storms there has been some water ingress” around the windows. He said the council is awaiting a report from its architects before deciding on the “appropriate remedy”. It comes after emergency refurbishment work was completed on the town hall in November last year to conserve its stained glass windows and to repair stonework. Shetland Amenity Trust, meanwhile, confirmed last week that water had been leaking into the Stevenson Room at Sumburgh Head Lighthouse – potentially putting the facility out of use until the spring. The Gilbert Bain Hospital – not for the first time – also suffered water ingress recently.